The best thing about summer is having access to an air-conditioner. Not only does it keep your house cool, but it provides an enjoyable environment to watch anime in! I was looking forward to watching Interviews with Monster Girls and being in a temperature-controlled location positively impacted my viewing experience. Tetsuo Takahashi is a high school biology teacher with a fascination for demi-humans. Demi-humans, or demis are they are typically referred to, are humans that have supernatural features. When succubus Sakie Sato begins working at the school, Takahashi renews his interest in learning more about demis. Takahashi sets his sights on the three demi students at school: Hikari Takanashi, a vampire; Kyoko Machi, a dullahan; and Yuki Kusakabe, a snow woman. Through interviews and general hang out sessions, Takahashi enables the demis to become more extroverted. He helps them work through their fears and concerns and provides them with a safe place to hang out when being around regular humans gets to he too much. This honest acceptance allows the girls to become more confident in their day to day lives, and they soon make friends with their fellow classmates. Not only does this do wonders for the students, but it causes Sato to open up more to Takahashi and become less self-conscious about her own powers. 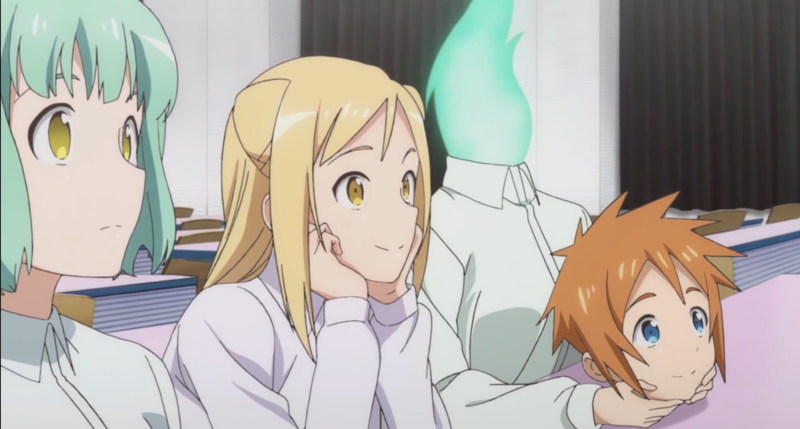 One thing that made watching Interviews with Monster Girls so enjoyable is how heartwarming the story is. None of the characters have ulterior motives for interacting with each other; it’s solely out of friendship and care. The anime also avoids any cliches, such as unexpected bullying or having one of the demis give into their supernatural side (which would be extremely out of character). While the anime does briefly touch on bullying, it is resolved fairly quickly and without the fallout typically seen when bullying is introduced, such as violence or character death. The one disappointment with Interviews with Monster Girls is how generic the characters look. I was hoping the demis would have something unique about them that made them look more supernatural, but they look like regular high school girls. 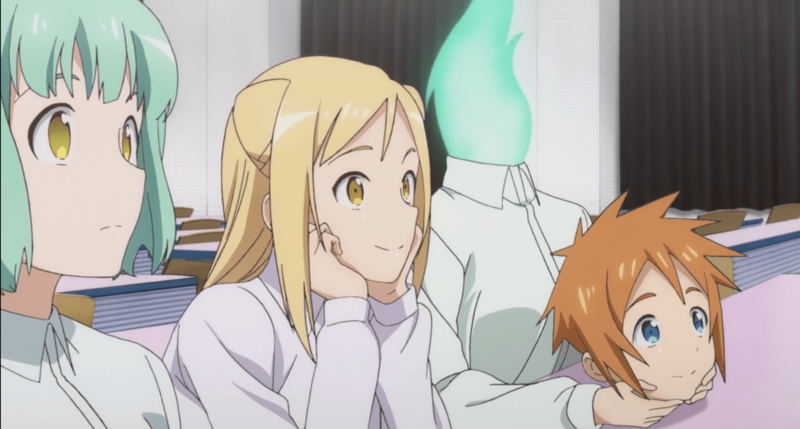 The show does some cool stuff with their demi characteristics, such as showing Hikari with reflective eyes. Still, it would have been nice to see the demis drawn with unique features. I was a little surprised with how much I enjoyed all of the characters in Interviews with Monster Girls. While Hikari was a little overbearing at times she came from a good place and always tries to help her friends. Even the vice principal – who serves as a source of conflict for all of one episode – is coming from a place of good intentions. It was great to see characters not become caricatures of classic anime tropes. I think what I enjoyed most of all was how Tetsuo had no romantic interest in any of the demis. Typical harem anime have the male lead fall in love (or lust) with at least one of the girls in the show. That simply isn’t the case here. Any attention or affection Tetsuo shows the demis comes from a place of academic interest in them, but most importantly, of genuine care. Tetsuo takes his role of teacher extremely seriously and does his best to ensure all the demis are looked after and have their accommodations met while at school. Much like the overall atmosphere of the show, the pacing felt slow and easy-going. Typically I find it hard to watch shows that move slowly, but that wasn’t the case here. No real source of tension or conflict allows Interviews with Monster Girls to explore the plot with no rush. It was extremely refreshing to be able to sit back, relax, and enjoy an anime for once. Overall, I highly recommend fans of anime to watch Interviews with Monster Girls. The light-hearted and easy-going pace and plot will allow fans to relax as they enjoy it. Fans looking to add Interviews with Monster Girls to their anime collection can purchase it here from Funimation.